FOUNTAIN VALLEY, Calif. – Hyundai Motor America recently celebrated the grand opening of Earnhardt North Scottsdale’s new state-of-the-art facility in North Scottsdale. The brand new 35,000 sq. ft. dealership features an expanded lounge built with customer comfort in mind and equipped with a full coffee bar and children play area. 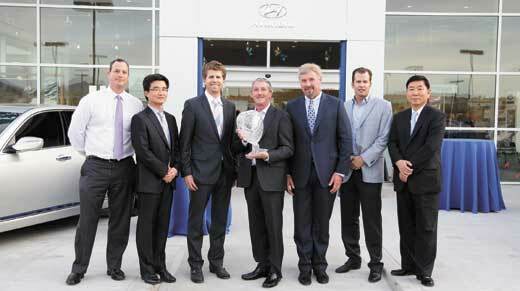 The new dealership facility officially opened its doors in December 2013. The private event celebrated the new facility and also honored the dealership’s outstanding sales record of most Equus’ sold nationwide in 2013. Top executives from Hyundai Motor America were in attendance, including President and CEO Dave Zuchowski and Vice President of National Sales, Bob Pradzinski. Also taking center stage was Hyundai’s highly anticipated 2015 Genesis sedan. A public grand opening was held from March 12 - 16. The new dealership will offer North Scottsdale and Valley of the Sun residents the full line of Hyundai vehicles, including the award winning 2014 Equus and the top-selling Elantra. And just around the corner will be the all new Genesis and Sonata. In addition to boasting a large selection of new premium Hyundai vehicles, Earnhardt North Scottsdale will also offer Hyundai’s Assurance Program, which includes the 5-year/60,000-mile fully transferable new vehicle warranty, Hyundai’s 10-year/100,000-mile powertrain warranty and 5-years of complimentary Roadside Assistance. Additionally, Hyundai Assurance offers Assurance Connected Care that provides owners of Hyundai models equipped with the Hyundai Blue Link telematics system with proactive safety and car care services, complimentary for three years. Earnhardt North Scottsdale Hyundai is located at 8445 E. Frank Lloyd Wright Blvd. in north Scottsdale. For more information call 888-489-9639 or visit www.northscottsdalehyundai.com.